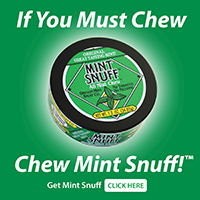 For Stores That Currently Carry Mint Snuff Pouches, click here. Or Order Online! University researchers have pointed the way. You can stop smoking and quit tobacco altogether with this Affordable, Simple, 2-step, Drug-free, Self-help quit tobacco program. You are not alone. There are 47 million smokers in the U.S., and 10 million smokeless tobacco users. They are all addicted to nicotine. You know smoking damages your health. It causes cancer of the lung, throat and mouth. Smokeless tobacco is far safer and it still delivers the nicotine you crave. Used in tiny, “invisible” pouches (like Skoal Bandits – Registered trademark of UST, Inc.) smokeless tobacco carries only a fraction of the oral cancer risk of smoking, and none of the lung cancer risk. It’s a safer alternative, and a useful stepping stone to quitting tobacco altogether. Tobacco-Free Mint Snuff Pouches™ from the Oregon Mint Snuff Company are 100% safe, and, since they feel and work just like smokeless tobacco pouches, they satisfy your need for oral gratification. You can do it! Switch from cigarettes – to smokeless tobacco – to Mint Snuff Pouches. In two easy steps you can be tobacco-free! No doctors, no prescriptions, no heavy expense. Do it at your own pace. You’re in control! In the Summer of 2000, two renowned U.S. oral health experts recommended that “inveterate smokers” (those unable to quit) should switch to smokeless tobacco to reduce their health risks. The researchers based their recommendation on a formal smoking cessation trial that used smokeless tobacco as a substitute for smoking and as a form of nicotine maintenance. The authors of this strategy are Drs. Brad Rodu of the Department of Pathology, School of Medicine, and Philip Cole of the Department of Epidemiology, School of Public Health at the University of Alabama/Birmingham. Dr. Rodu is author of the book, For Smokers Only: How Smokeless Tobacco Can Save Your Life. Information is available at www.DrRodu.com or at 205-934-3380. (1) Smoking is an efficient way to absorb nicotine, an addictive drug that produces many pleasurable effects. However, nicotine does not cause cancer, heart attacks or emphysema. Those illnesses are caused by some of the other 3000 products of tobacco combustion. (2) Smokeless tobacco provides the nicotine kick smokers crave, but without the smoky delivery system. Thus, use of smokeless tobacco is 98% safer than smoking. (3) Finally, smokeless tobacco is NOT chewing tobacco, and it can be used invisibly in any social situation, much like a breath mint. The important second step to quit tobacco is the switch from smokeless to tobacco-free, nicotine-free, natural Oregon Mint Snuff. Switching from smokeless to tobacco-free Mint Snuff Pouches is easy. Mint Snuff Pouches have the same size and feel as tobacco pouches. They’re just as invisible, and just as satisfying. To use: Place a Mint Snuff Pouch between your cheek and gums. Let the flavor crystals slowly dissolve. Mint Snuff Pouches are a healthy replacement for cigarettes, chewing tobacco and chewing gum! And they freshen your breath, too! Mint Snuff Pouches fix coffee breath, beer breath and garlic breath. They’re really strong! Mint Snuff Pouches are miniature teabags filled with mint and crystallized mint oil or other flavors. Mint Snuff Pouches are the perfect alternative to cigarettes and smokeless tobacco and they freshen your breath, too! Pouches are available in Original Mint and Wintergreen. They’re especially popular as a convenient breath freshener because one Mint Snuff Pouch can last up to an hour, they’re virtually invisible to others and they don’t interfere with conversation.